I have used this car seat for my other 2 children and just ordered one for my third. The quality of this car seat is amazing and my kids love it. They always fall asleep in the car because it is so comfortable. 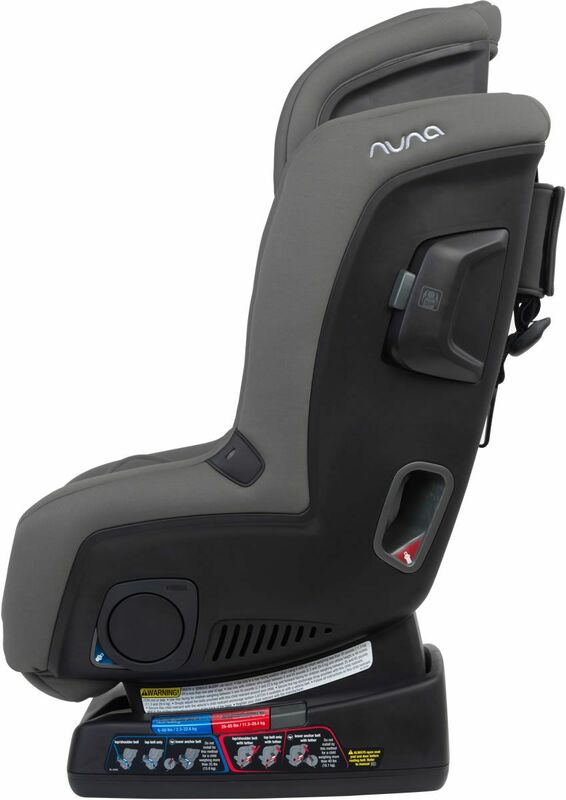 After our son grew out of his Uppababy Mesa car seat, we bought the Nuna Rava. Our son loves this car seat and so do we. It is easy to get him in and out and he seems very comfortable. He has no problem happily sitting in it for long road trips. 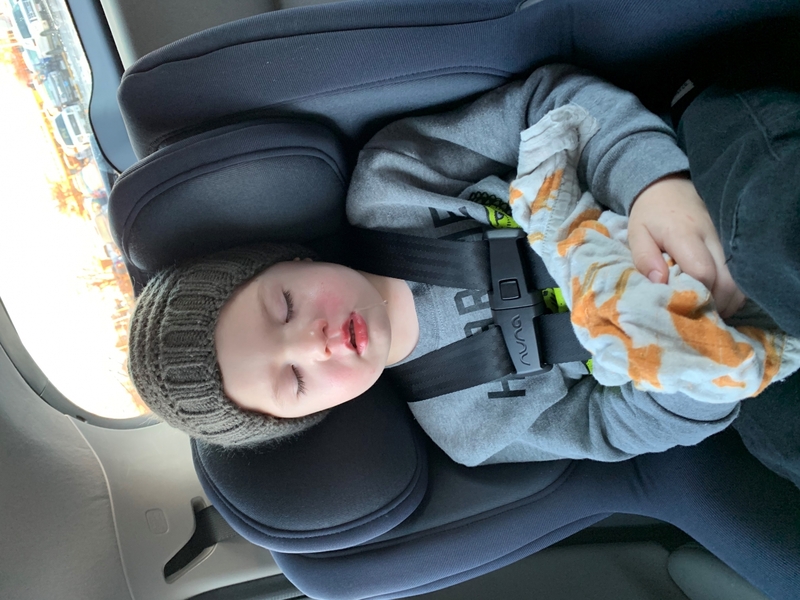 Even though he is tall for his age at two and a half, we will be able to keep him rear facing for a long time thanks to the design of the Rava. ConsIt is bulky so best for keeping in a single car. Also because of the size it is a little difficult getting child in and out if you have a smaller back seat area. Excellent convertible car seat; bought 2 so we would have one in each car. I think the RAVA is even better than the Pipa, because of the buckle holder tabs. Fairly easy to remove the cover for cleaning (partially machine washable) and vacuuming. I had to reference youtube to figure out how to remove the washable part of the cover, though. My only gripe is that the crotch strap tends to fall into the seat, so you have to dig it out from under baby's bum half the time. We really loves this car seat. We first started with the nuna pipa, but once my son outgrew the infant seat we bought this one. It seemed very comfortable, lots of safety features and very easy to install. We did, however, return it. It did not fit in our vehicle very well (3 seats across the middle row) and our son just cried because he wanted a seat like his sisters. Very high quality, great seat though. Well worth the money. I did a lot of research when it came to my babies car seat. I Decided not to get the regular car seat but to get this convertible one. My baby was born 5 lbs. 5 oz. and his car seat was perfect for her from the moment she was born she is now seven months old and is really comfortable for her the inserts came out and I got adjusted also somehow be putting her f decided not to get the regular car seat would you get this convertible one. My baby was born 5 lbs. 5 oz. and this car seat was perfect for her from the moment she was born she is now seven months old and itâ€™s really comfortable for her the inserts came out and I got adjusted also somehow be putting her front fasing. Overall this is the best investment. This car seat is wonderful! We have used it starting at birth when my child was 5 lb 9 oz. It fit her wonderfully and has continued to work well with her for the last year. We recently had to replace car seats due to a wreck, and loved this one so much we got it again. My favorite part of this car seat is the button by the feet of the child where you can loosen and tighten the straps. I use this to get her in easily each time we use the car seat. First time mom and I love it! Iâ€™m confident my lil one is securely fastened and safe in this car seat. Easy to install, comfortable. We own 2 - one in each car (myself/wife) and they work great. My daughter has been using this car seat for about a week. She is still rear-facing, and we have only used one of the 10 recline/angle settings. This car seat is so easy to install, and it feels secure, sturdy, and safe. The strap holders (little pockets on the side of the seat for you to slide the buckle ends into when your child is not in the car seat) are genius and really reduce the amount of time and frustration spent trying to untwist the straps when it comes time to buckle the little one in. It is fairly easy to tighten the straps once she is in, but depending on the angle at which you have installed the seat, the seat of the car itself can get in the way and cause it to be a little awkward. Overall, I am very happy with this purchase. I am confident that my daughter is safe every time she rides in it, I'm happy it's easy to transfer between vehicles, and it looks nice too! Also, I am very happy that with this seat installed in the middle of my back seat, the 2 side seat belts are still accessible and usable. I didnâ€™t believe the video on how easy it was to install, but it is tightly in and was easy peasy to do. Plus itâ€™s gorgeous, comfy, and my granddaughter loves it! ConsA little heavy but I don?t intend to carry it around! There's a lot of features on this, and although it took a minute to read through everything in the manual, installed effortlessly into our SUV and easy to adjust to fit the little guy. Everything feels very well made (as you would expect from something at this price point!) - and looks great. There's a lot of blah looking seats out there and this is not one of them. Highly recommend, I'm buying a second one for the other car! Exceptional quality! Safety is top notch. It is easy to install. Heavy, like most convertibles, but not as bulky as, say, a Britax. I love the ease of adjusting the height of the straps - particularly important to me because I can put both my 3.5 year old and my 2 year old in with a simple 2 second adjustment of the headrest/straps. We loved the Nuna Pipa so much that we knew we needed this next! It was a no brained! My son is comfortable and itâ€™s easy to install! We have been using the Nuna Rava for our 3.5 year old and just purchased this new one for our almost-one year old. We love this seat for the extended 50lb rear facing weight limit, and all of the other convenience features. It's super easy to install with the seat belt and you get a foolproof tight install every time. This means I can be confident that grandparents and others can also easily use these seats without my help every time. I have compared it to the Chicco Nextfit (which we used to have) and a Clek Foonf (which I tried out at a local store). 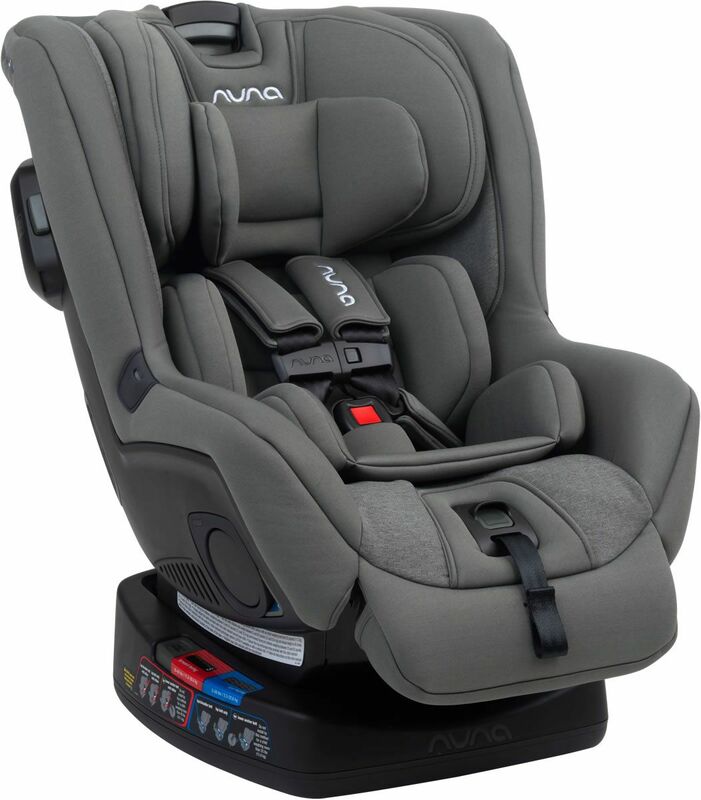 The Nuna wins because it combines the extended rear facing weight limit, gives a bit of extra leg room, can be set on any of the recline settings you like, is comfy for my kids, and is so easy to use. It's an expensive seat, but so worth it. Canâ€™t say anything bad about it. Looks high quality and artived on time! Looking forward to using it. Seems super safe. Perfect for his big boy car seat! Love the safety of Nuna products and the luxurious materials! 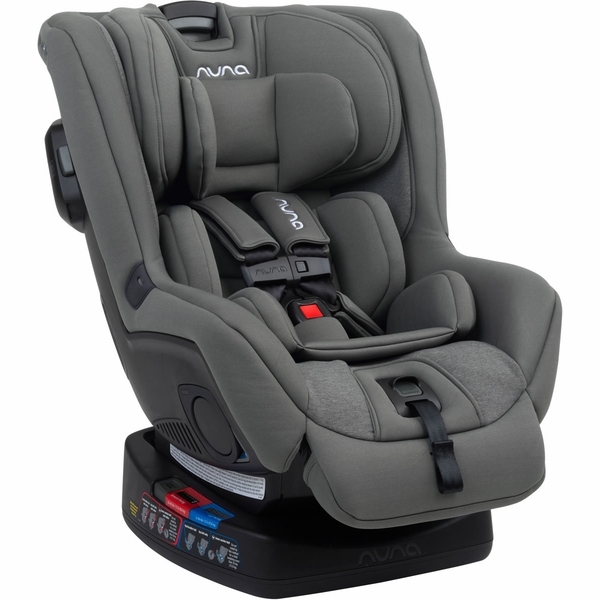 This car seat has all you can ask for, great build quality, small in overall size; granite color is a little lighter than it appears on the picture. Albee baby's time to ship was outstanding. This seat is really high quality and easy to install. The high rear facing weight limits are going to last us a long time. Very high quality, definitely recommend it! First time buying something by Nuna. Seat is very nice and appears to be worth the extra money. This car doesnt only look great but my baby loves it. My baby is 8 months old but big for his age so this car seat has so much room for him to stretch out his legs. Also the breathable material doesnt make him sweat. So easy to install! Bought this for my grandson who will be here soon so we havenâ€™t used it yet. I bought it for safety & comfort. I am sure we will love it!!! We love the safety factor of this seat as safety was our top priority!! 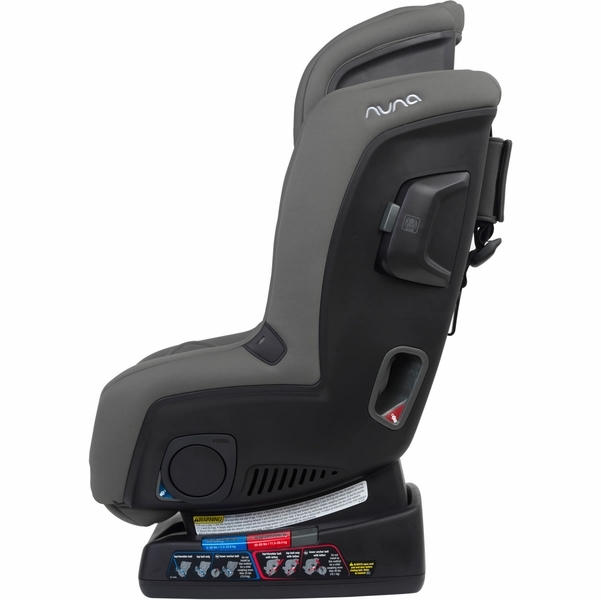 We also like the sleek design of the Nuna Rava. After seeing how well the Nuna Pipa held up during infancy, we knew we wanted to go with the Nuna Rava for a convertible car seat. This seat frees up a lot of legroom on even the most reclined option while rear facing. We LOVE IT and plan to purchase another one for my husbandâ€™s vehicle. I love the simple install, high quality feel, sleek look, and all the safety features. It's great this seat rear faces until 50 lbs too! My son has plenty of space in this car seat. He's 90th percentile in height and weight, so we need it! Its very comfortable for him both awake and asleep. It has everything youâ€™ll ever want in your little oneâ€™s car seat! We absolutely love this car seat! It has more legroom than any other I have looked at, is super easy to clean, and my little man is so comfortable in it he falls right to sleep once we start moving. He slept 4 straight hours on our way to the beach, and didnâ€™t sweat at all because of the vents. We are a Nuna family for life! ProsSoft, comfortable, easy to clean. ConsHeavy and hard to install. Easy to install, very safe and comfortable. The best children items I have choiced. This is a large convertible car seat compared to a couple other models but is very versatile and very comfortable for toddlers. The Diono and Clek's Foonf and Fllo are better options if you need a narrower seat but does not offer the excellent padding that comes with the Rava. Can't wait to try the Uppababy Knox when it comes out summer 2019. Best car seat Ever! It look very sleek and easy to install! Was leery to spend this kind of money on a carseat, but was very pleased. My son sweats in his current Nuna Pipa Lite, which is the main reason I chose the 2019 due to its breathable fabrics. I am very pleased, so much so that I purchased another one and my mother purchased one as well! The installation was effortless with no pulling, tugging, tightening. My baby is very comfortable in it. I can't say enough good things about the quality and ease of installation and adjustment. I actually have more legroom for my passenger compared with our infant car seat. While the price might seem steep, whats the price of a new iPhone? I have a Santa Fe Sport in the picture. Loving my Nuna Rava seat at first it was hard to tighten the straps but then they started to loosen up and tighten easily. The fabric is amazing and soft and itâ€™s a super sturdy seat. I seriously feel like my son it way more safer in this seat than his previous seat. I bought this car seat over a year ago for my 2 year old nephew and still absolutely love it and he loves it! the car seat belt if you have an older vehicle as well as the 5 point harness for extra stability. I have taken this seat in and out often and its very easy but heavy. 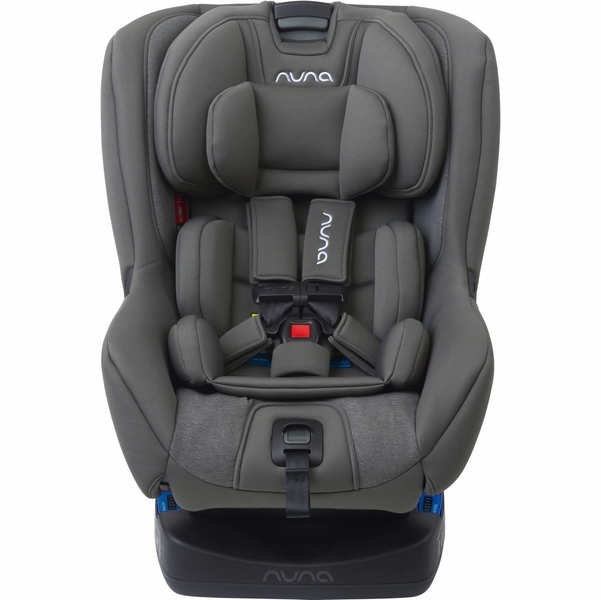 This car seat made me fall in love with Nuna products and I don't even have children. You know your kiddos are safe, comfy and happy. Would love to get two more for my twin nieces. The only downside is that they are expensive and rarely go on sale otherwise I'd buy everything Nuna! I love this seat. Everything from delivery to installation was perfect and my son is super comfy and safe. Nuna is definitely my go to brand! The Rava transitioned us from our infant car seat. It was fairly easy to install, and our baby looks so comfy cozy sitting in it! We recently purchased this car seat for my son who had outgrown his previous one. Upon arrival I noticed how durable this thing was, not to mention the quality of the material was an added bonus! The best thing about this car seat is the ease of installation! I can literally install this car seat in less than a minute and have it so snug and secure it doesnâ€™t budge on the seat! I love that it has several options for the recline position. My son is very comfortable in this. 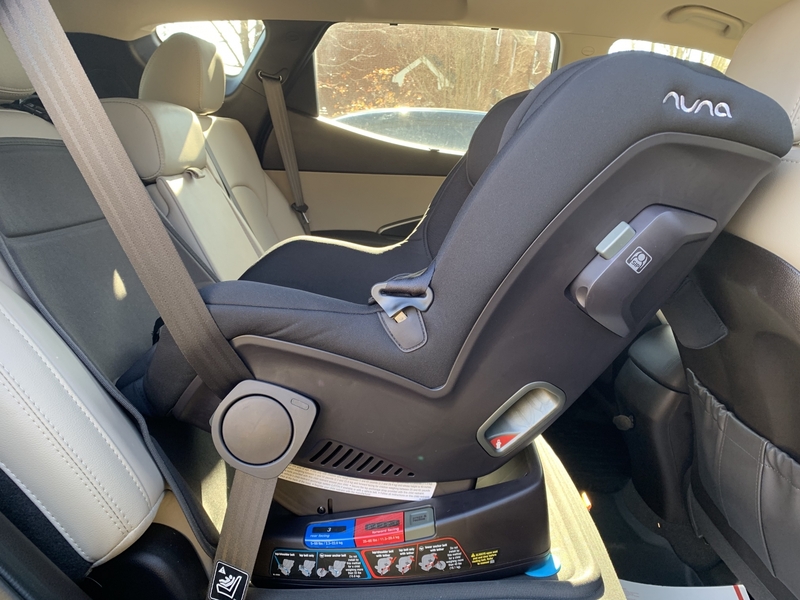 The ease of adjusting the height on the back of the car seat for the shoulder straps is worth the price alone on this car seat! 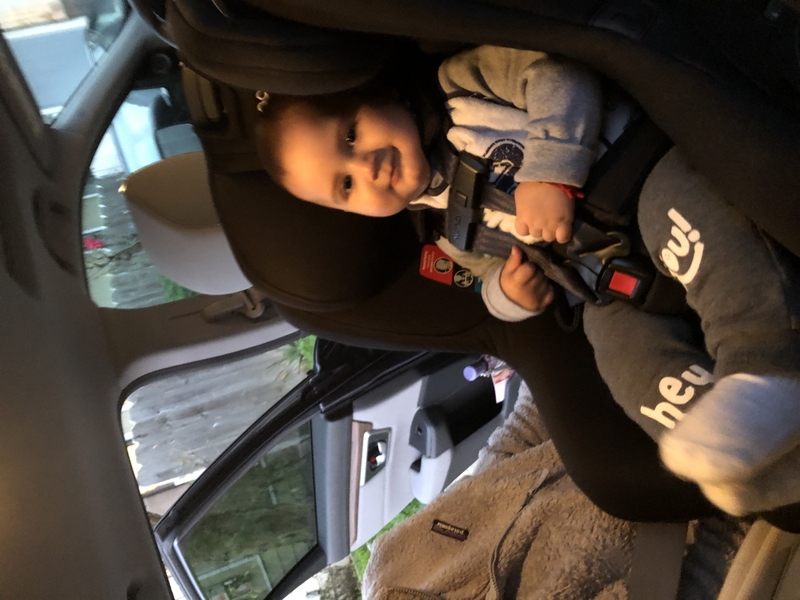 With his previous car seat we had to undo straps and thread them through the little holes to adjust the height for his shoulders, a time consuming and teadious job, but not anymore! The retractable drink holder is awesome, too. Itâ€™s easy to hide away when not in use. I love that this car seat has shoulder strap AND waste strap protection pads, as well as one for the buckle that goes between his legs, no more discomfort from straps cutting into his skin! This car seat is the Cadillac of car seats for your growing child. I highly recommend this purchase to any parent looking for a safe, reliable/durable, comfortable car seat for their child. This car seat is awesome and worth every penny! I bought this for my toddler and he loves this car seat, sometimes he just likes to be in the car seat and we drive around so he can relax! He is not the type who would sit somewhere so it's a great relief that he loves this! We love this so much that bought it for our new born as well! as soon as he grows out of his newborn seat, he'll move into this one! It's also really install and reclines really well. I very much trust it as well. Proscomfortable, easy to install, looks good. As soon as I got this car seat in and opened it I knew I made the right decision! It has a lot of space and my son is super comfortable in it. Very easy to install as well! The material seems easy to clean. Highly recommended! My daughter has this car seat but in the reddish color and both of us loved it! 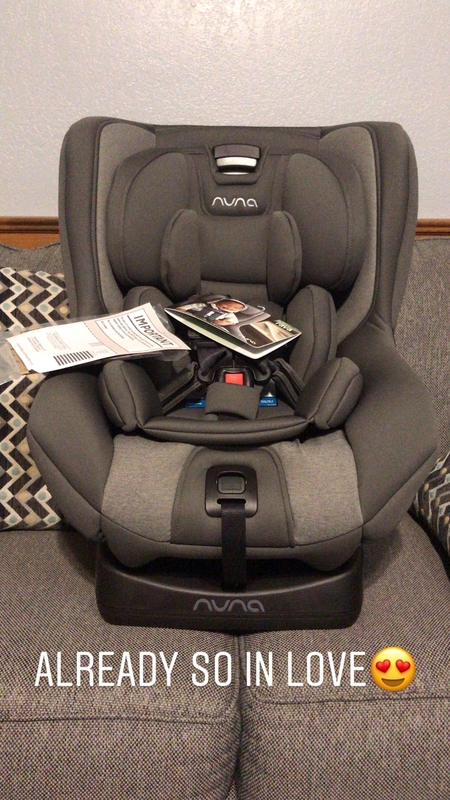 My little guy is growing out of his nuna pipa, so itâ€™s time to upgrade and I wouldnâ€™t want any other car seat but the nuna Rava! Now little man can match his big sister :) Definitely the best car seat on the market! Great car seat! So easy to buckle baby in. Super comfortable material! Iâ€™m super happy with the purchase! Itâ€™s on the pricy side but itâ€™s well worth the money!!! 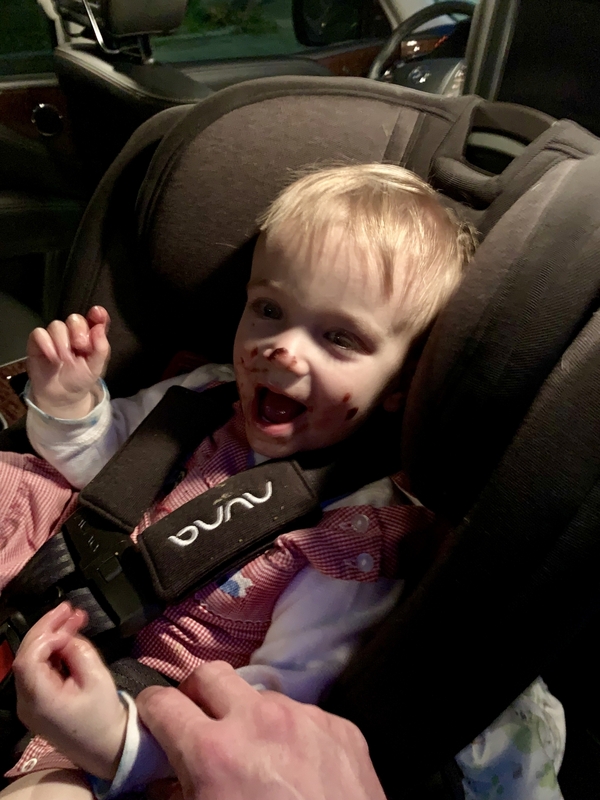 We have this car seat in every car and we love it. it is very comfortable car seat than other brands. you can use it for a long time ï¼probably 4yearsï¼‰. howeverï¼Œ it is a little bit heavy for mom. The car seat is very compact. And my child loves it. The height can be adjusted easily as the child grows up (the child grows up quickly). plush car seat! The easy install is fabulous! Love the clicktight technology! Fool proof! The cover washes well although I found it a little tricky to to put on back perfect but not a show stopper. Great safety ratings as well! Great looking and smaller profile car seat. So easy to use and install. Baby seems very comfortable in it. The straps don't get tangled up like in with some other brands. Nuna makes great products! Energy absorbing foam and SIP pods take side impact security to the next level, with an all steel frame and reinforced belt path for superior protection. A 10-position recline for optimal comfort, and recline angle guides clearly confirm the perfect riding angle. Laid back legroom gives up to 2 inches more leg room rear facing, and extra support for forward facing riders. With a one-hand height adjustable 10 position head support and 2-position no re-thread crotch strap RAVA effortlessly grows along with your child. It’s uncomplicated, un-fussy and exceeds American safety standards. 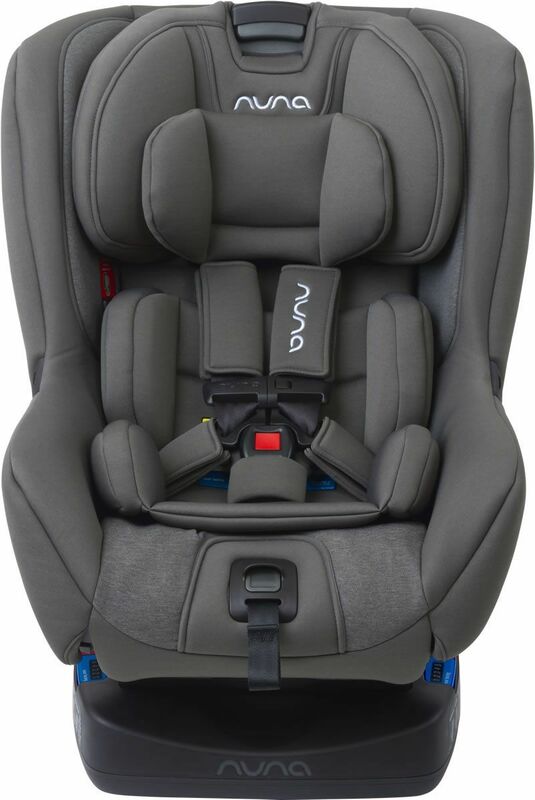 Our RAVA convertible car seat is filled with little extras like laid back legroom, fuss-free adjustments, and our unique simply™ secure installation that makes setup a snap, all while being FR free. So you can relax and enjoy every magical, messy, covered-with-crumbs moment. Simply™ secure installation allows for an install that is swift, secure and straightforward. Energy absorbing foam and side impact protection (SIP) pods take side impact security to the next level. Baby can ride rear facing for longer: Up to a whopping 50 lbs. Dual flip-open cup holders. So they can drink when they want. Laid back legroom gives up to 2 inches of extra space for rear facing riders. And extra leg support for forward facing riders. Ten position headrest can be pulled up with one hand. Five position recline for rear and forward facing riding. Washable knit fabric and ventilation panels make little riders super comfy. Infant insert and head support. Just take the pieces out and they’re good to grow.